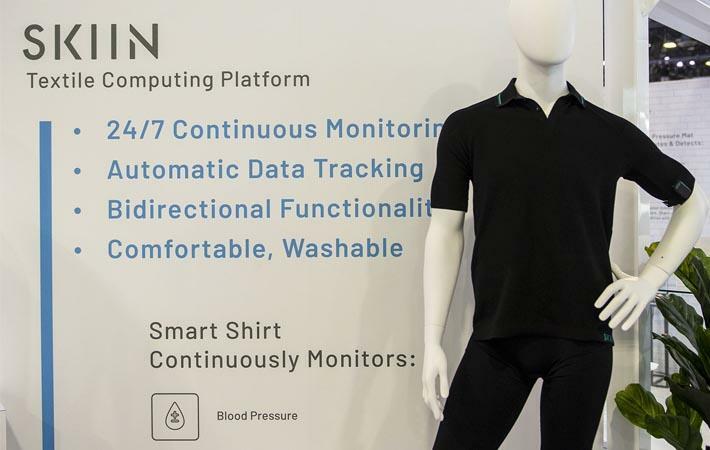 Myant, a leader in the production of smart textiles, has launched the world's first cuffless blood pressure monitoring technology inside its Skiin Textile Computing Platform, at the recent CES 2019. The Skiin Smart Shirt eliminates the hassle of regular blood pressure monitoring and adds automatic data tracking to share data and trends with clinicians. With more than 250 sessions, CES conference sessions touched nearly every topic arising from the show floor, including key trends and emerging technologies. Myant's Skiin Textile Computing platform integrates innovative sensor and actuator technology into the fabrics that surround us every day. This includes the world's first smart garment that delivers continuous, cuffless blood pressure monitoring in a comfortable and machine-washable polo shirt. In 2019, Myant plans to release both its Skiin Smart Underwear for heart health detection (with ECG, HRV, activity, sleep and temperature monitoring) and its Skiin Smart Shirt with continuous blood pressure monitoring. Planned additions to the Skiin platform include slip and fall detection, driver fatigue, ovulation and a suite of chemical sensing markers. The result is smart clothing that enables users to proactively manage their health, stay connected and lead longer and more comfortable lives.